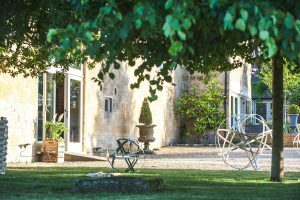 Hannah and Chris were thrilled to find their perfect Cotswold wedding venue had opened just up the road from their house near Chipping Campden. Not only was it a big moment for them, but also a big moment for our team as it was our very first wedding, having just launched in January! And a perfect day it was too. 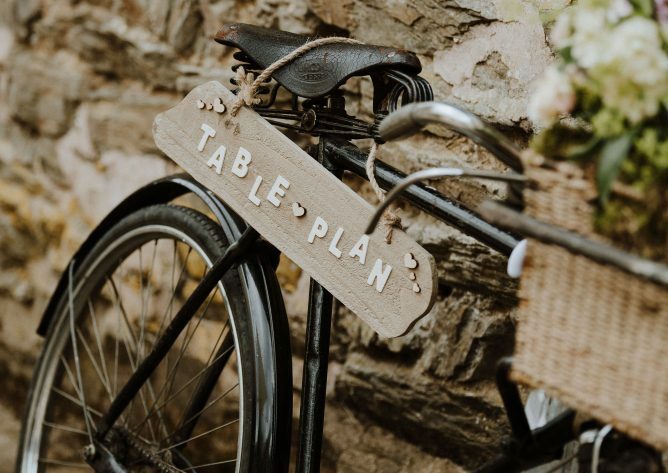 When Hannah and Chris first visited Lapstone Barn at our wedding fair in March with snow on the ground, it was hard to imagine their wedding day could be a glorious summer’s day in June! Warm, sunshine, blue skies, a gentle breeze – a perfect day for this beautiful couple to start their exciting new journey together. From the moment we first met Mr & Mrs H, we knew they were laid back and straight forward. 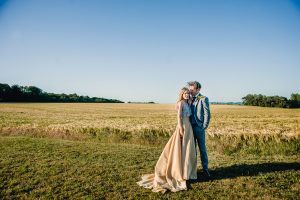 They knew exactly how they wanted their wedding day to look and feel – relaxed, informal and fun, with a country feel. 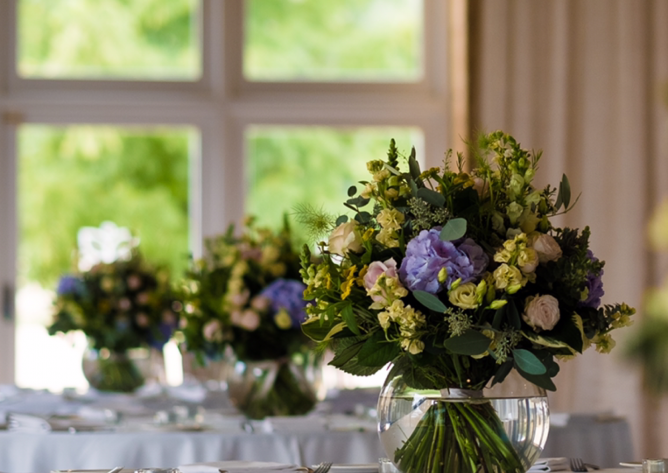 Being so local to Chipping Campden, it felt like they were the perfect couple to celebrate our big moment too – as a brand new Cotswold wedding venue, this was OUR VERY FIRST wedding! Hannah had worked so hard to bring lots of personal touches to their day. 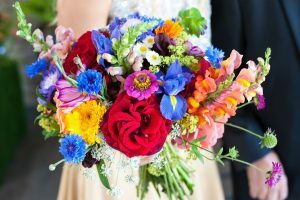 Friends and family helped arrange theie colourful floral decorations – orange, purple, red, blue, yellow, pink – created a colourful riot both at Mickleton church and at their reception at Lapstone Barn. Tin cans strung with orange ribbon, a bird cage for wedding cards, the collection of old bottles filled with fairy lights. 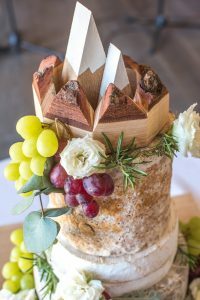 Even the wooden alpine-inspired cheese cake topper was made by the groom himself as a reminder of their engagement in the mountains! Guests mingled in the sunshine in our beautiful courtyard garden as the bride and groom arrived in their own VW campervan – covered in flowers no less! 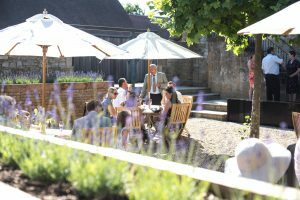 Everyone enjoyed sipping prosecco and nibbling on delicious canapes before sitting down to enjoy sharing plates from our barbeque menu. The simple table decorations were so effective and added pops of colour to the room. After dinner Hannah and Chris cut their cheese cake in front of their glorious silver birch trees and huge planters packed with hostas and ferns, which brought a little of bit of countryside indoors. Followed by their first dance as husband and wife, which truly got the party started! 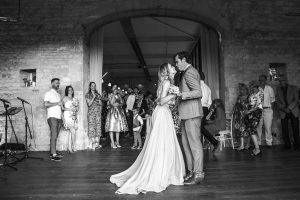 And in that moment, Lapstone Barn had come alive – after months of hard work it was surreal for the team to see it filled with happiness and laughter, and finally being enjoyed as a beautiful wedding barn. And we are so thrilled for Hannah & Chris that their memories of married life started right here. Photography by Rachel Jones Photography, one of local recommended suppliers.